The mission of internal audit department is to provide independent, objective assurance and consulting services designed to add value and improve the organization’s operations. It helps the organization accomplish its objectives by bringing a systematic, disciplined approach to evaluate and improve the effectiveness of control and governance processes. Resources are acquired economically, used efficiently, and protected adequately. Provide annually an assessment on the adequacy and effectiveness of the organization’s processes for controlling its activities in the areas set forth under the mission and scope of work. Report significant issues related to the processes for the controlling of activities of the organization including potential improvements to those processes, and provide information concerning such issues through resolution. Coordinate with other control and monitoring functions (e.g. compliance, security, legal, ethics, environmental, and external audit). Develop a flexible annual audit plan using appropriate risk-based methodology, including any risks or control concerns identified by management, and submit that plan to the Provincial Governor for approval. Implement the annual audit plan as approved, including, as appropriate, any special tasks, or projects requested by management. Maintain a professional audit staff with sufficient knowledge, skills, and experience, and professional certifications to meet the requirements of this charter. Establish a quality assurance program by which the CAE assure the operation of internal audit activities. Perform consulting services, beyond internal auditing’s assurance services, to assist management in meeting its objectives. Examples may include facilitation, process design, training and advisory services. Issue periodic reports to the Provincial Government and the Governor summarizing results of audit activities. Keep the Provincial Governor informed of emerging trends and successful practice in internal auditing. Provide a list of significant measurement goals and results to the Provincial Governor. Assist in the investigation of significant suspected fraudulent activities within the organization and notify management of the results. Consider the scope of work of the external auditors and regulators, as appropriate, for the purpose of providing optimal audit coverage to the organization at a reasonableoverall cost. Have full and free access to the audit committee. Allocate resources, set frequencies, select subjects, determine scope of works, and apply the techniques required to accomplish audit objectives. Perform any operational duties for the organization. Initiate or approve accounting transactions external to the internal audit department. Direct the activities of any organization employee not employed by the internal audit department, except to the extent such employees have been appropriately assigned to auditing terms or to otherwise assist the internal auditors. 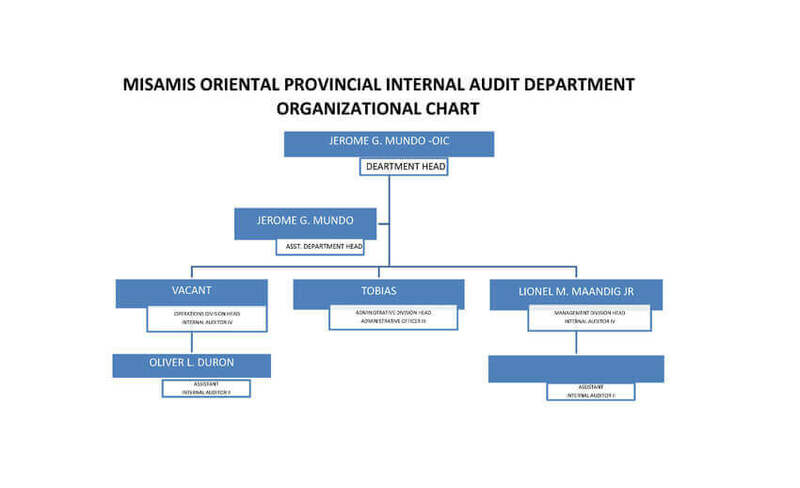 The Misamis Oriental Provincial Internal Audit Department will meet or exceed The Institute of Internal Auditors’ International Standards for the Professional Practice of Internal Auditing. Risk assessment activities were conducted by the Misamis Oriental Provincial Internal Audit Department (MOPIAD) among 15 departments/offices so as to assist the management in identifying, quantifying and prioritizing existing and potential risks confronting the departments/offices against achieving respective goals and objectives. Seven (7) Standard Internal Audit Procedures and one (1) Special Audit Procedures were also conducted by the MOPIAD and the corresponding audit reports were rendered. Relatedly, some draft operational manuals of some 24 departments/offices were being reviewed.